There has been a lot of coverage lately over whether stock buybacks are beneficial to investors. First, let’s recap why companies repurchase their own shares, and then present arguments for and against the practice. Finally, we’ll list U.S. companies that are just throwing away their (and possibly, your) money. Publicly traded companies issue additional shares to raise cash to fund projects or acquisitions, or to award employees with stock. Issuing shares dilutes the share count, which means if you hold shares, your percentage ownership of the company declines. Many companies repurchase enough shares in the open market to make up for the dilution caused by the issuance of new shares. Some companies go further, buying back even more shares to lower the share count, which boosts earnings per share. The biggest argument in favor of net buybacks is that they boost earnings per share, something that can translate to a higher share price. After a board of directors authorizes a buyback plan, a company’s management may accelerate or decelerate the purchases, depending on cash flow or how the shares are trading in the open market. If a company is performing well — sales and profits are rising, for example — buybacks can have a wonderful effect on the stock price. Another argument in favor of buybacks is that they are more “tax efficient” than dividends, unless you are holding the shares in a tax-deferred retirement account. If you receive dividends, you may have to pay taxes on them. If your shares rise in value, you pay no tax unless you sell them for a profit. The problem with buybacks is that there’s no guarantee that they will be “worth it.” The stock price may still fall or underperform benchmark indices, especially if the company forgoes investments in maintaining or growing the core business while buying back lots of shares. And some companies seem blind to any notion of market timing, as they continue with massive repurchases even when the shares are trading near all-time highs. Even the “tax efficiency” argument is a bit weak. Keep in mind that on the federal level, chances are that your dividends are treated as “qualified dividends” and are “subject to the same 0%, 15% or 20% maximum tax rate that applies to net capital gain[s],” according to the Internal Revenue Service. International Business Machines Corp. IBM, -0.79% is a poster child for questionable buybacks. If we review the 10 years through 2015, using data from financial statements compiled by FactSet, we see that IBM spent $119.1 billion on common-share buybacks. During that period, IBM’s shares returned 103%, with dividends reinvested. This was slightly ahead of the S&P 500 SPX, -1.05% which returned 102%. But over five years, IBM bought back $59.1 billion in common shares, while its stock returned only 5%. Meanwhile, the S&P 500 returned 81%. There have been plenty of solid arguments that IBM could have made much better use of that money by investing in its business. After all, the company’s annual sales have declined 24% over the past five years, while its earnings have dropped 16%. We thought it would be useful to see which companies had underperformed the broader market while spending massive amounts of cash to repurchase shares. Going back five years, FactSet has repurchase data for 312 U.S.-based S&P 500 companies. 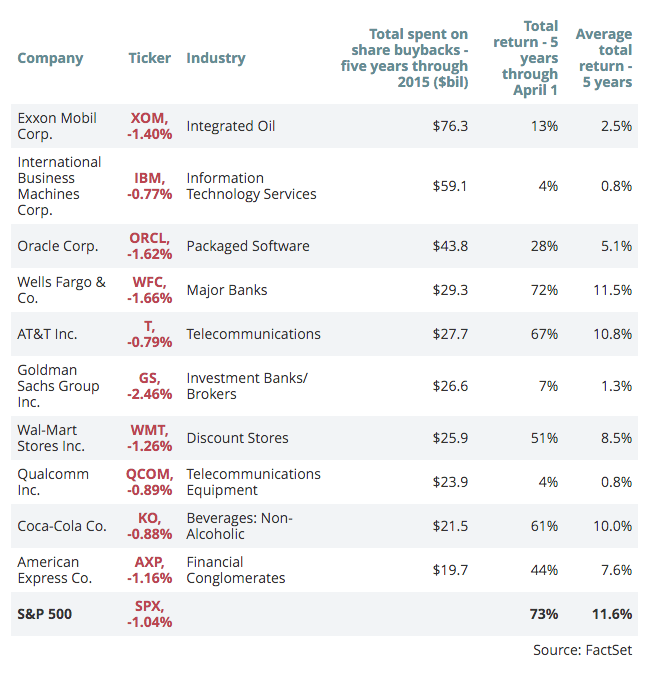 In fairness, even though Exxon Mobil Corp. XOM, -1.45% tops the list, the company’s stock is down 10% over the past two years, reflecting the decline in oil prices and cuts in capital spending. Assuming oil prices recover, as they always have, Exxon’s long-term tale could be a very good one, several years from now. Has the share count been declining significantly, or is most of the money spent on buybacks just making up for the dilution caused by massive stock-based compensation packages to executives? Are earnings (not earnings per share) decreasing? Has spending on research and development been in a slump? Pay attention to what a company’s management is saying. Are they bragging about “returning capital to shareholders” when they buy back massive amounts of shares? How can they say they are “returning capital” to you, if you are losing money? You will hear countless arguments in favor of buybacks over dividends. That’s because buybacks give management “flexibility” to spend the cash when they see fit, and because buybacks are more “tax efficient” than dividends for investors holding shares outside retirement accounts. But after seeing so many billions spent on buybacks when share prices are high, you might question how well management makes use of the flexibility. If you are not satisfied with the answerers to the questions listed above, while your long-term investment is floundering, you can make your voice heard by voting against the re-election of the board directors who approved the buyback policy. If you’re really miffed, you can speak up at an annual meeting. And when considering new investments, all the questions listed above must also be answered as you do your own research.